At Purr’n Pooch Pet Resorts, our clients inspire us to outfit our facilities with the best pet care products on the market. By investing in innovative materials like the environmentally friendly K9Grass from ForeverLawn, Inc., we ensure good clean fun for visiting pets, as well as pet owners who would prefer more time cuddling with their best friends than wrestling with them in the tub. 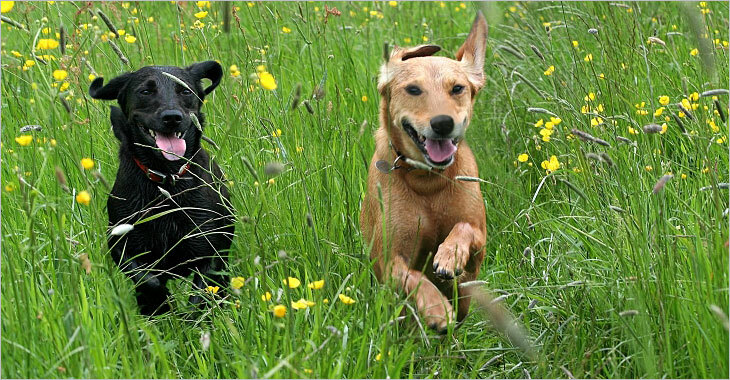 Digging in the dirt, jumping in muddy puddles and roaming through the grass are all favorite pup pastimes, but at Purr’n Pooch we make sure that our pets still enjoy themselves without the fuss of daily baths or potential health hazards like fleas, ticks and bacteria that may lurk in grass and dirt. 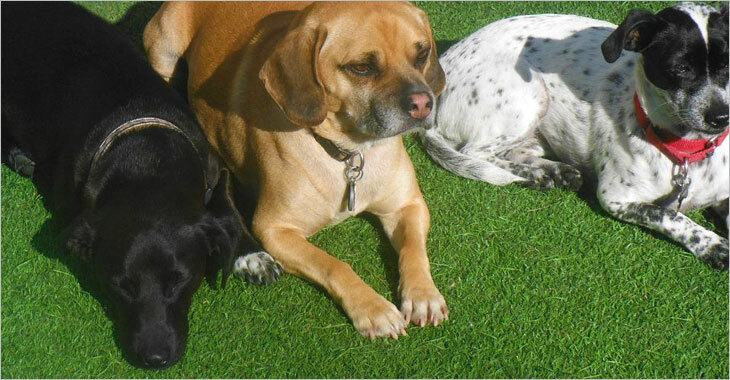 Our microbial turf is specifically designed for dogs and has been installed at both our Wall and Tinton Falls locations. Its flow-through backing, short dense blade structure and antimicrobial protection give pets a cleaner, safer environment to play. The fresh smell on our playgrounds always amazes visitors, and when caring for dogs daily, quick and easy playground cleanup is essential to a healthy and enjoyable environment. K9Grass’ antimicrobial protection also makes it possible to avoid using chemicals, pesticides and insecticides to keep our surfaces free from insects and bacteria. Our playgrounds are resilient enough to withstand the wear and tear caused by our energetic dogs, as well as New Jersey’s seasonal weather changes. Its knitted backing provides for instantaneous and immediate drainage of the turf, so any liquid will wash away automatically. K9Grass is tough and durable, but it also has a cushioned, soft surface that gives our guests, both big and small, a comfortable experience while they enjoy playing with friends winter, spring, summer or fall. As one of the nation’s first pet care facilities, Purr’n Pooch and the Palazzo Family continue to invest in products that give pet owners piece of mind and provide a safe, fun environment for visiting dogs and cats. Stay tuned for details as this summer Purr’n Pooch will celebrate its exciting renovation in Wall Township, NJ. Our luxury resort will feature superior cat and dog suites; indoor aquatic pool for therapy, weight loss and enjoyment; grooming and spa rooms; and a jungle playground for our feline friends. To tour the facility, media are invited to contact Jennifer Smiga of inBLOOM Communications at 201-892-9403 or jen@inbloomcomm.com. Spring has arrived and with warm spring weather comes more than just flowers blooming and allergies. It’s also flea and tick season, and this year in particular is going to be a problem for many pets because of the unusual weather we’ve experienced across the NY/NJ region. Ticks usually begin to appear in April and continue to hang around as late as November. Flea season is mostly influenced by weather conditions such as temperature and humidity. The Weather Channel has created a tool that allows you to see when fleas are most active in your area. In parts of the northeastern region of the United States, including New Jersey, flea activity will occur from April through December. Take necessary precautions to protect your pets while on-the-go and at home. The first step to ensure a pest-free season is to pay attention to your yard. Fleas and ticks spend their time in long grass and shady outdoor spots; so keep your grass cut short by mowing regularly and removing all weeds. Also be sure to clean up dead leaf piles with a rake or leaf blower. Ticks like to hang out in leaf piles, so the last thing you want is your furry friend jumping around in leaves. If you use mulch in your yard, choose one that deters insects such as cedar, and cover your garbage at all times to keep common tick host like rodents and other critters safely away. An all-natural plant based flea and tick repellent. The product is applied from a tube onto the shoulder blades and will spread throughout the whole body. 100% organic treatment and a natural way to rid your dog of pests, while avoiding the use of chemicals. It creates a light body scent that will keep fleas and ticks away. A 3-in-1 spray that contains a full spectrum of effective, all natural ingredients. A quick spritz before you leave the house will ensure that your best friend is armed against all outdoor enemies. We also offer all natural flea and tick bathing for dogs and cats at our grooming and spa salon. Contact us in Wall or Tinton Falls to schedule and appointment. Enjoy a safe and fun season outdoors with your best friend! 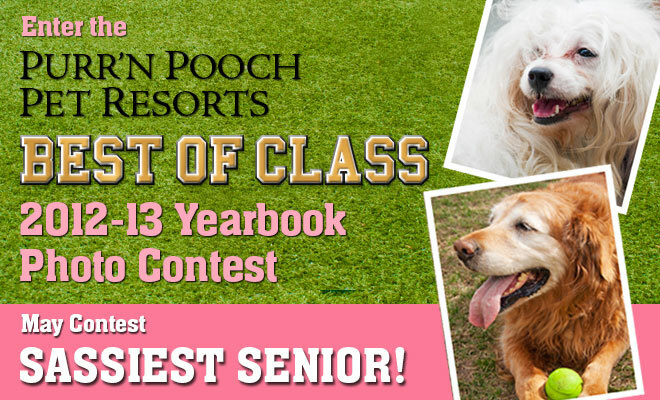 Enter the Purr’n Pooch Best of the Class of 2013 Yearbook Contest! Every month, your dog or cat is invited to enter our virtual yearbook and a chance to win a different monthly prize from Purr’n Pooch. DEADLINES: The Photo Contest for “Sassiest Senior” Starts on May 7 at 9 am. Submit photos by May 12 at 10 pm. Voting begins at May 12 at 10 pm and ends May 20 at 11 pm. HOW TO ENTER: Submit a photo(s) of your cat or dog on our Facebook Page Contest Link. You can submit as many photos as you like by the submission date. The entry with the most votes will win the monthly class title of the month. May voting is for “Sassiest Senior”. One vote per day. The prize is a Hydrotherapy Bath and your pet’s picture in our virtual yearbook published Fall 2013. PLEASE NOTE TO VOTE: If you are on the Purr’n Pooch Pet Resorts Facebook page to vote for your favorite entry, you need to like the page to vote in the contest. You can vote every 24 hours for your entry of choice. Still having problems? Make sure you have disabled the cookies on your computer so you can view third-party apps. The contest is a third-party app because Facebook requires you use one to run a contest within their promotional guidelines. Good luck!